Create a project office to plan an integrated transportation network and highway decongestion measures for Laval and the Montreal North Shore. Extend highway 19 to Bois-des-Filion and create reserved lanes linking Cartier metro station. 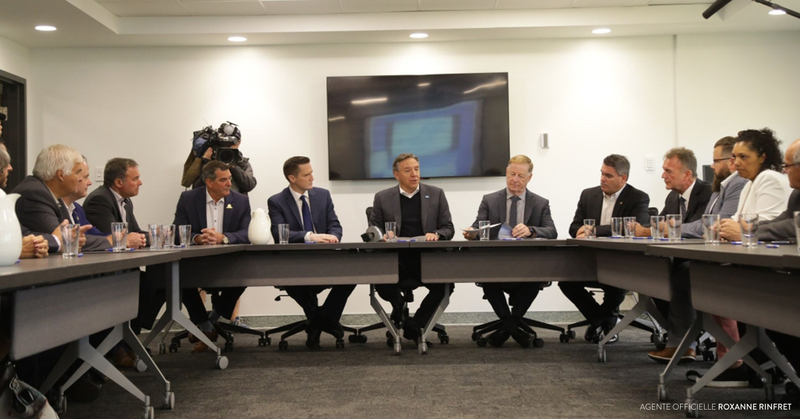 During a meeting with North Shore mayors today, François Legault announced his intention to set up a joint project office composed of representatives from the Québec, Laval and Lower Laurentians municipalities governments to develop an integrated transportation network and highway decongestion plan. “We can’t magically fix 15 years of Liberal neglect. What I can commit to, however, is that we will do all it takes to complete the transportation projects as quickly as possible and finally end road congestion on the North Shore”, vowed the CAQ leader. François Legault explained a CAQ government would extend the REM from Du Ruisseau station to downtown Laval, as well as highway 19 to Bois-des-Filion including a section of reserved lanes linked to Cartier metro station. He also said reserved lanes were in the books for highways 13, 15, 19, 25, 440 and 640. “The Liberals have been in power 15 years. If we want things to change in Québec, if we want to do more and to do better for the people of the Lower Laurentians, we have to start by changing government. The only party that has the team to defeat the Liberals is the CAQ”, François Legault said.